Learn: What are the IPv4 and IPv6 protocols, what are the differences between IPv4 and IPv6, what are their address formats? In our last posts, we have discussed about two commands ping - to ping a node connected with IPv4 based network and ping6 - to ping a node connected with IPv6 based network. In this post, we are going to learn about IPv4 and IPv6 network protocols with their differences and address formats. IPv4 is version 4th of Internet protocol, which is first widely, used internet protocol. It is most popular protocols of standards-based inter-networking methods over the Internet and It was deployed for production in the ARPANET in 1983 for production. 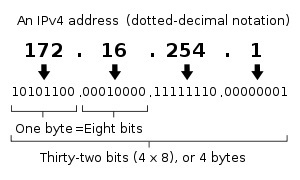 IPv4 protocol is represented by 32-bit integer value. it uses dot-decimal notation, it consists of four octets separated by dot(.) . Maximum value of one octet can be 255. Here, First octet is 192, second is 168, third is 10 and fourth octet is 25. IPv4 is support by almost all operating systems like: Windows, Linux, MAC and others. Sometimes for subnet mask we use CIDR notations. IPv6 is the 6th version of internet protocol, which is recent and widely used version of internet protocol. Every device in network has its unique IPv6 address for identification, it is successor of IPv4 protocol, which was launch in 1998 for production. IPv6 was developed by the Internet Engineering Task Force (IETF) to resolve the problem, when IPv4 addresses limit is exceeds in network. Actually, in IPv6 we have freedom to use address more than IPv4. It uses 128 bit to represent an IP address and it allows 2^128, or approximately 3.4×1038 addresses. IPv6 is an internet Layer protocol of TCP/IP (Transmission control protocol) model. It is used for packet-switched internetworking and it provides end-to-end datagram transmission across multiple IP networks. It supports stateless address auto configuration. IPv4 was developed in 1981 and IPv6 was developed in 1998. IPv6 uses 128 bits, whereas an IPv4 address use only 32 bit. We can use more address in IPv6 as compared to IPv4. We can make router’s task simpler using IPv6 as compared to IPv4. IPv6 address is suited for mobile networks as compared to IPv4. 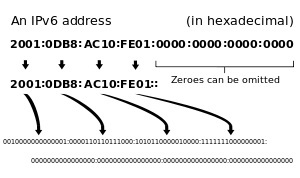 IPv6 addresses are represented in a hexadecimal, they are separated by colon (:), while IPv4 address use dot (.) to separate octets of address. Now a day's IPv4 is more used by almost all companies but some companies are using IPv6 addresses. IPv4 uses ping command to check network connectivity between two Nodes whereas IPv6 uses ping6.